Does it make sense to lock money for life at 9.3 per cent? Is it right time to invest money for long term? Senior citizens need regular income as a replacement for salary. Still, most people who get a lump sum at retirement don't want to put a lot of money in annuity plans. While some fear they may not be left with enough money for emergencies, most worry about low pension rates that don't beat inflation during most periods. Keeping this in mind, the government has revived an old scheme, Varishtha Pension Bima Yojana (VPBY), offering lifelong pension at 9.3% per annum. The scheme is open for one year from August 15 this year. It is a single-premium pension plan for senior citizens who are 60 years and above. Pension payments start immediately, though the lock-in period is 15 years. However, as senior citizens may need funds any time for medical or other emergencies, the scheme allows withdrawal before 15 years by paying an exit load of 2% on the amount. Partial withdrawals are not allowed but you can take a loan against the policy after three years. So, does it make sense to lock money for life at 9.3%? Yes, say experts, as interest rates are likely to fall in the near future and 9.3% will be a very good return for a fixed-income instrument such as VPBY. Moreover, by allowing investment only up to Rs 6.39 lakh, VPBY ensures that you do not invest all your money in a single instrument. One can combine it with the senior citizen savings scheme and monthly income plans offered by mutual funds for getting regular income. There is no cap on investment in annuity plans of private companies. Rahul Goswami, CIO, fixed income, ICICI Prudential AMC, says, "We believe that with falling inflation, structural positive liquidity, stable currency, lower current account deficit and improving government finances, interest rates will be much lower from their current levels over the next two years. Therefore, we recommend people to invest in duration funds for the long term." VPBY gives the option of receiving pension monthly, quarterly, half-yearly or annually. The maximum and minimum amounts that can be invested are decided according to the duration of payments. For instance, you will have to invest upto Rs 6.66 lakh if you want monthly pension. This will give you Rs 5,000 every month. For annual pension, the maximum investment is Rs 6.39 lakh, which will give you Rs 60,000 every year. LIC, which is running the scheme, had sold more than 10,000 policies by the end of September. The scheme was first introduced by the previous NDA government. Then, LIC had sold 3.16 lakh policies amounting to Rs 6,095 crore. Mayank Bathwal, deputy chief executive officer, Birla Sun Life Insurance, says, "India has a huge middleaged population that is likely to live longer. Therefore, there is need for products that guarantee income after retirement. In the absence of social security, annuity products help customers earn guaranteed income." So, as more and more people start to buy deferred annuity plans (where you accumulate a pension fund during working life), experts say a large number of people will opt for immediate annuity plans such as VPBY too. 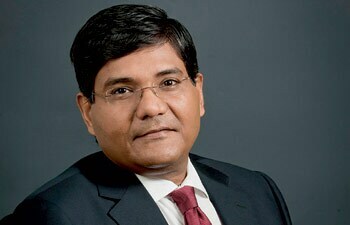 Rituraj Bhattacharya, head, product development, Bajaj Allianz Life Insurance, says, "The new pension product guidelines have made it mandatory for companies to bridge the gap between deferred and immediate annuity plans wherein the insured will have to compulsorily buy immediate annuity from the same insurer on attaining the vesting age." Let's compare VPBY and annuity plans offered by private players. An immediate annuity plan is a single-premium plan. The premium collected is invested in the available bonds. Insurers are usually conservative while deciding the rates because of the long-term nature of these plans. There have been instances of foreign insurers becoming bankrupt because of annuity plans. That's why private insurers do not offer more than 6-7% return (See Comparison of Annuity Plans). LIC is offering more as the scheme is sponsored by the government. Niraj Shah, senior vice president and head, products, ICICI Prudential Life Insurance, says, "Due to limited availability of long-term debt instruments to match the annuity payout liability, the asset liability mismatch exposes insurance companies to significant interest rate risk. With increasing longevity, reinvestment risk increases further, thereby making it more challenging to price annuities." There are other factors as well. Sunil Sharma, chief actuary, Kotak Mahindra Old Mutual Life Insurance, says, "The annuity rate depends upon the age of the person. The longer he isexpected to live, the higher will be the cost of the payment. Therefore, an older person will get more than the younger person." Annuities protect a customer from the risk of outliving retirement savings. There are few financial instruments that offer guaranteed income as long as the person is alive. While VPBY offers only one option-annuity for life with return of premium on death-private players offer various options ranging from annuity payable for one's chosen term of 5/10/15/20 years, annuity payable for life at an increasing rate, and joint life, where annuity is first paid to the primary investor and after his/her death to the spouse. You must choose the right type depending upon your needs. For instance, annuities that provide a return of capital at death are often used for estate planning. Bathwal of Birla Sun Life says, "The most popular is annuity with return of the purchase price as it offers a comparatively higher annuity rate and secures the investment for the nominee in case of the person's death." While the Insurance Regulatory and Development Authority has not prescribed any age limit, private insurers typically offer plans for those in the age bracket of 30-90 years. VPBY, however, is only for senior citizens (60 and above). Bajaj Allianz Pension Guarantee, the immediate annuity plan offered by Bajaj Allianz Life Insurance, has 37 as the minimum entry age. Similarly, Birla Sun Life Insurance offers annuity plans for 30- to 90-year-olds. Aalok Bhan, director, productsolutions management, Max Life, says, "There is no age limit for buying an annuity plan. However, like all products, immediate annuity plans serve a particular need." Agents earn very little commission in LIC's Varistha Pension Bima Yojana (VPBY) compared with other insurance plans. While VPBY pays around 9 paisa as commission to agents for every Rs 100 invested, traditional and unit linked plans pay up to 15-30%. On the purchase price of Rs 6.39 lakh (maximum amount that one can invest under VPBY), an agent earns just Rs 575. So, your agent might not approach you for selling VPBY. It is better to ask yourself if you want to buy the policy. Immediate annuity plans cater to retired people who want guaranteed income. A life insurance plan may not be useful for those in this age group. Sharma of Kotak says, "Insurance can be bought with annuity. It may vary from product to product. However, one should keep in mind that the cost of insurance is very high in old age. It's difficult to justify any need for insurance after retirement." Bhan of Max says, "At present, annuities in India do not offer insurance. But there can be annuities which cover some critical illnesses or other insurable events. These require a developed market. India will get there eventually." Private players generally do not give loans against annuity plans or allow premature surrender. VPBY, however, allows you to surrender the policy after 15 years. You can even surrender before 15 years if you need money for treatment of critical illnesses of self or spouse by paying a 2% surrender fee. A loan, of not more than 75% premium, is also offered after completion of three policy years. Pension is taxable. Senior citizens need to pay tax if their income exceeds Rs 3 lakh. For people above 80 years the limit is Rs 5 lakh. 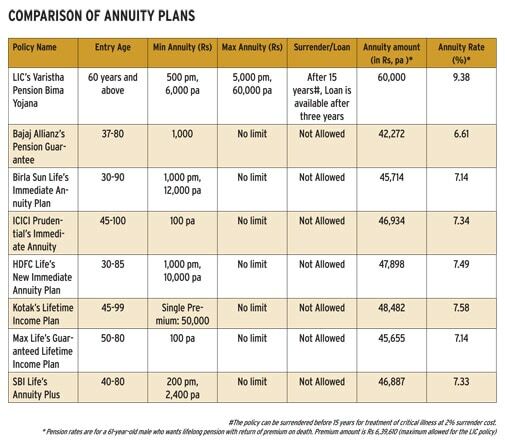 For those who want regular income after retirement, annuity plans may provide a solution. The secret is to pick the best plan.